Cooler weather means mornings on the veranda with a hot cup of coffee looking for the first signs of turning leaves. I love this time of year. Wearing sweaters, cooler nights with a warm quilt on my lap, looking forward to a fire in the fireplace, some wool applique handwork, a lovely scented candle, and a good book. 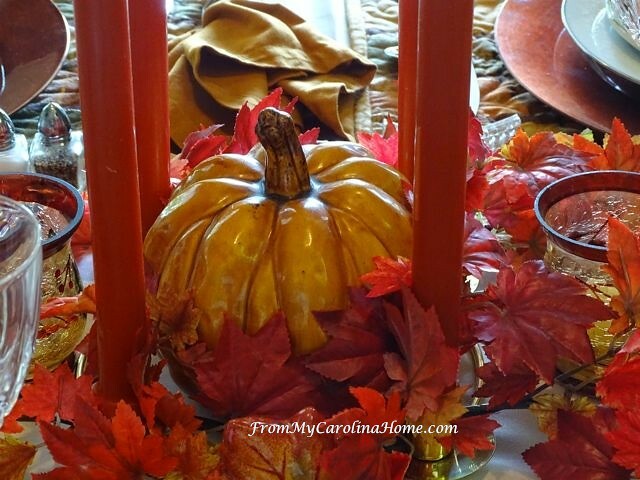 I enjoy decorating to usher in the season with an Autumn inspired tablescape. I’ve mentioned this before, our table is visible from the loft next to our bedroom, so a pretty tablescape is a decorative display that I see every morning as I come down the stairs. 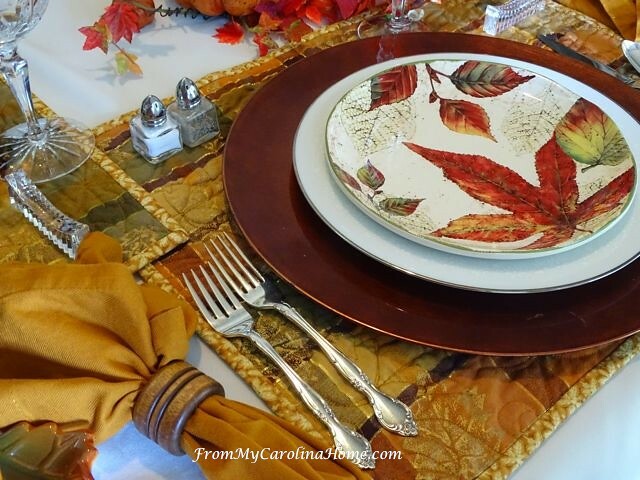 This year I got out my Autumn placemats that I made a few years back with some wonderful plaid fabric with gold Autumn leaves. They are simple rectangles, quilted with a maple leaf pantograph, then bound as usual. 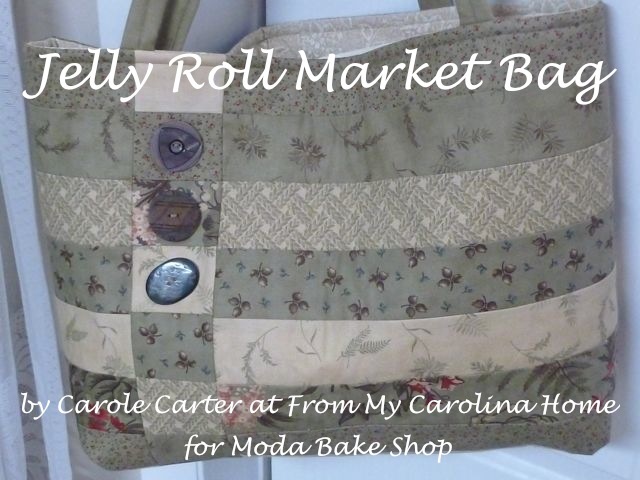 The fabric was a secret sister gift in a longarm group. 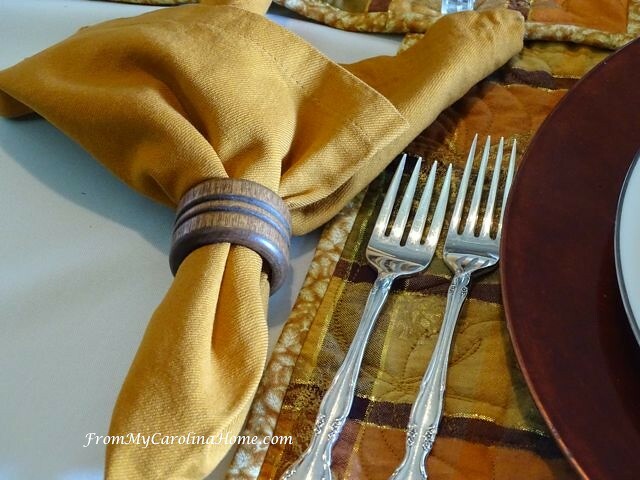 I put the placemats on a cream color tablecloth to set them off, and added my Nutmeg Spice napkins with wood napkin rings. 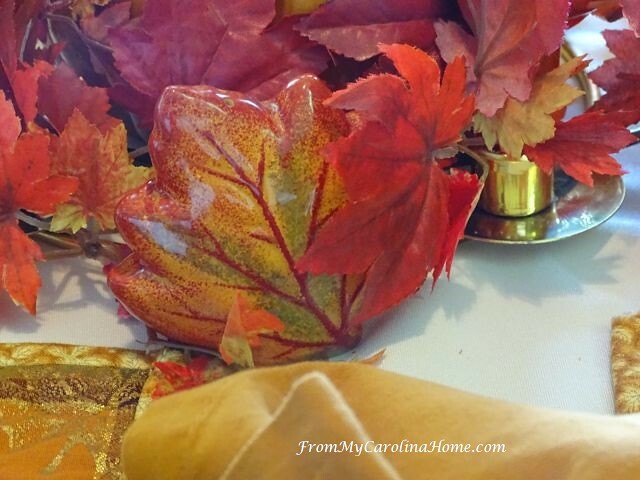 The plate stacks have my copper color chargers, with white dinner china plates, topped with these Autumn Leaf plates from Pier 1. I swear, they should pay me for all I do for them, LOL!! Don’t you love that store? Above the knives on the placemat, I set knife rests, a gift from a friend and the first time I’ve had a table to use them. 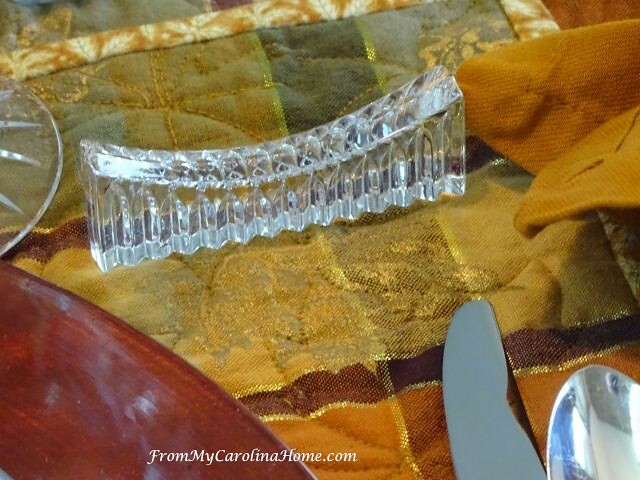 This is the kind of detail that makes a tablescape just a bit more special, not to mention it saves your placemats from getting quite as dirty. As usual, I add individual salt and pepper shakers. I had to do a silverware polish, but that really didn’t take too long. I use the Wrights Silver cream with water, and it is fast and easy. Wine glasses are added too, these were a thrift store find. Taking a closer look at this year’s centerpiece, I used my Advent candle holder to hold four rust color candles, then added a large ceramic pumpkin to the middle. Autumn leaf garlands span the length of the center table. Another thrift store score, these ceramic leaves are really salt and pepper shakers. I nestled them into the garland leaves as a surprise for those willing to look at bit closer. My crackle glass votive holders and ceramic pumpkins are on each end of the centerpiece, surrounded by the leaf garland. The colors of the elements of the centerpiece really go together well. Another thrift store score, these pumpkin bowls fit into my existing leaf plates nicely, and would be great to serve salad dressings. I put a set on each end of the table. Another look overall, with all the elements in place. I am ready for autumn! You can see my tablescape from last year using a more rustic theme HERE. Did I mention how much I love these plates? LOL, I think I should get the dinner plates too. Are you ready for Autumn? 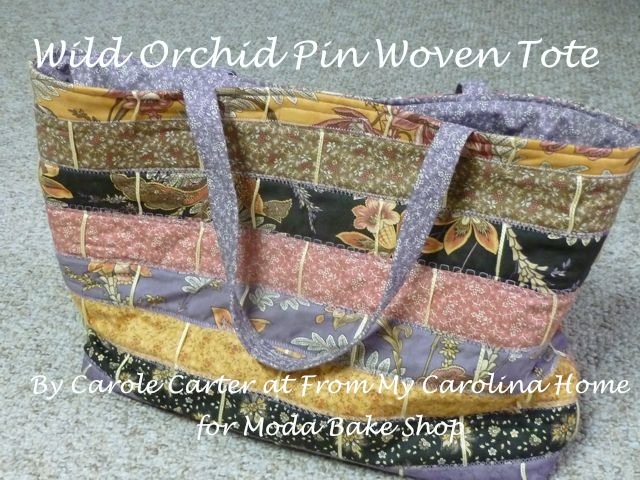 Do you have any special things that come out for the season? 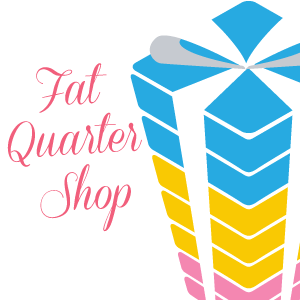 My blog has some affiliate links for Amazon and Fat Quarter shop. Using my links will enable me to make a small commission on any sales without affecting your prices. These small commissions will help to support the costs of the blog. You can still use your existing accounts with the vendors. 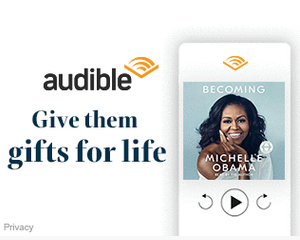 I am committed to never having animated ads, or things that popup on pictures, banners that hide the top or bottom of the blog, or anything obnoxious. Thank you for using my links!! Hopefully soon I can upgrade and get rid of the WordPress ads that appear at the bottom of posts, at this time I have no control over those. What a beautiful layout…you really made it look lovely…something I am not good at, at all…so I love to look at other people’s table art….thx for sharing! 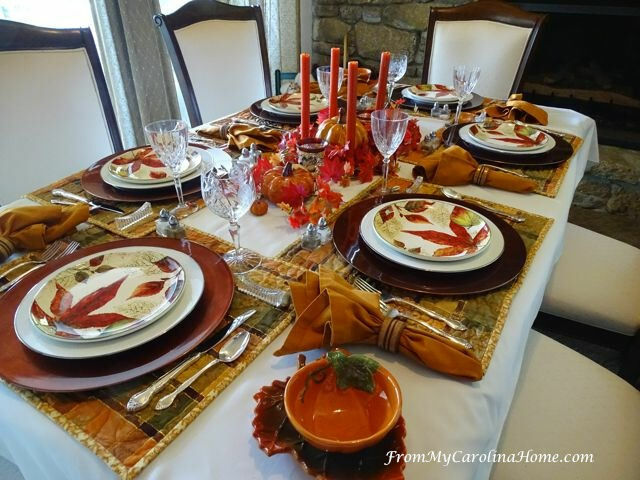 Your lovely tablescape looks like it could be in Southern Lady Gracous Tables. I collect pumpkins and decorate with them varying what I do each year. A few leaves are starting to turn in the trees behind my house. Your tables are all so pretty. I love seeing all of the different beautiful dishes you have. 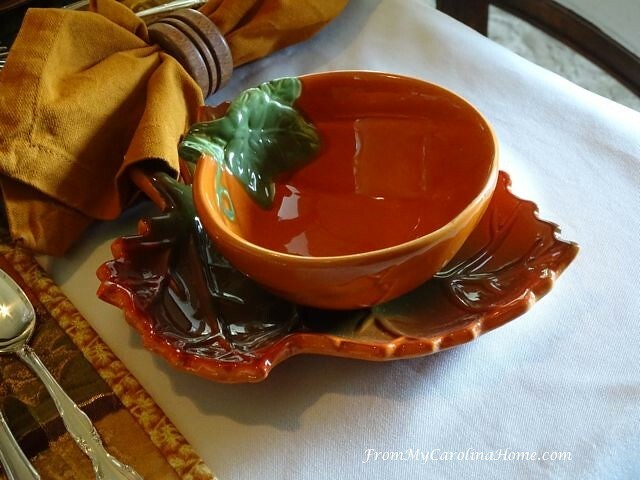 Love the “finds” like the soup bowls and the LEAF SHAKERS!!!!! Overall a lovely, lovely presentation. What a pretty table setting you have. Your dishes, decorations are perfect. What are you serving? VERY PRETTY! Right now my table is decorated with baskets and boxes of cucumbers , tomatoes and peppers. I need to get off of this computer and get to work. NO!!! I am NOT ready for autumn. I love summer & hate to see it go. But I love your tablescape…those dishes are wonderful. 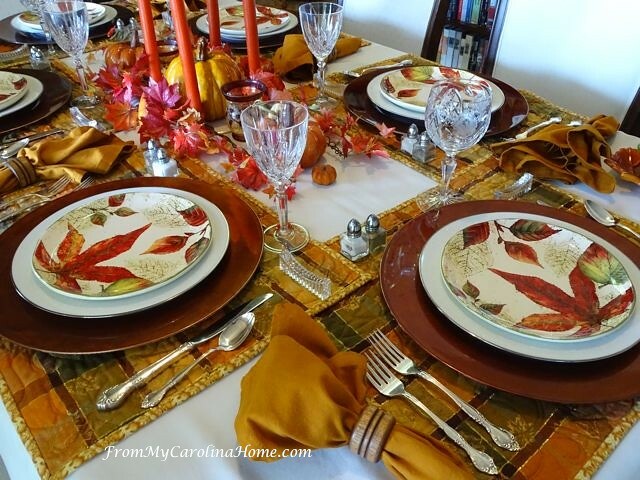 Autumn is my favorite season, and I love this tablescape. You always pull everything together so beautifully! We pulled out our Autumn décor yesterday! I just have a few special things we enjoy each year. I’m also definitely ready for cooler weather, crisp mornings and pumpkins! Not quite ready for full autumn decor yet – I do a “transitional” color scheme and theme of gold and green with sunflowers in September, then Halloween in October and “full fall” in November, using non-Halloween type pumpkins then with autumn leaves, etc. 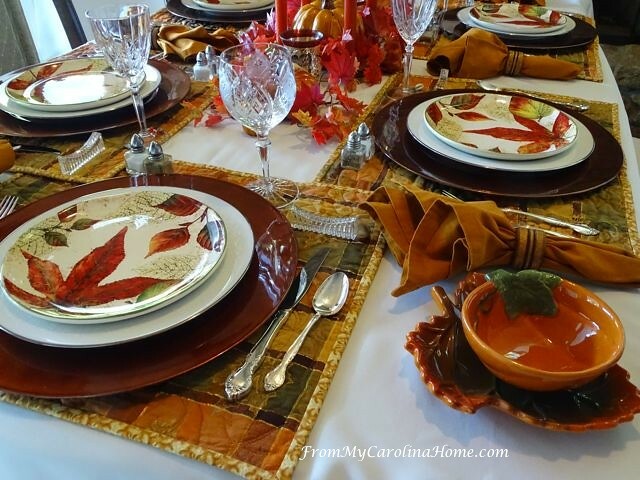 Every meal is eaten in our dining room as we do not have any other dining area in our home so I always change the tablescape for every season and holiday. You just gave me a great idea, though (another one!) 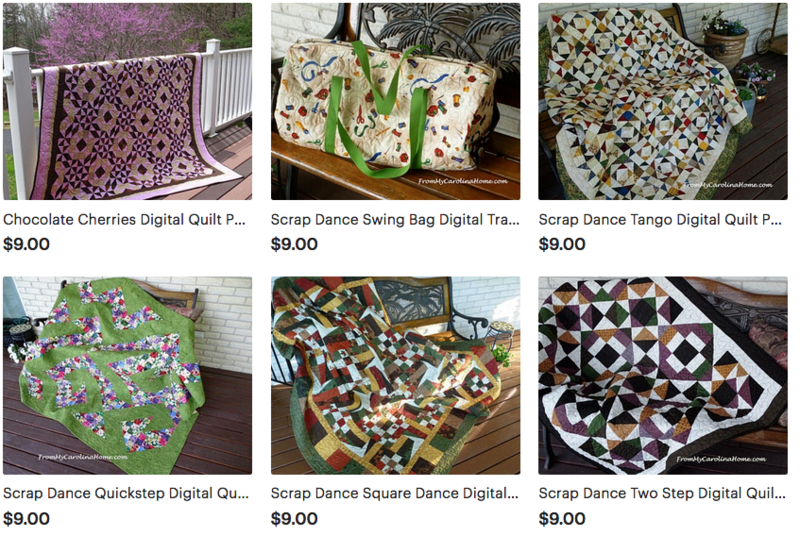 – I’ve been thinking of making a set of placemats but didn’t think I had time and/or skills to piece and then quilt them all right now, but if I go through my (voluminous) stash, I know I have fabric that is printed and would make great placemats by the quilting method you used without having to cut, seam, etc. all the pieces. 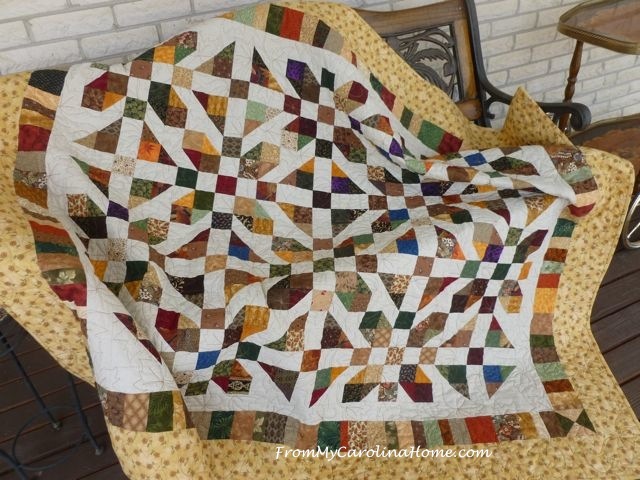 I don’t have a pantograph, but could transfer an uncomplicated stencil to the fabric and quilt by my regular sewing machine….hmmm!!! Exciting idea!! Your tablescape is exquisite this year as well as last year. I really enjoy seeing them, thanks for posting. Its springtime here in Queensland Australia and warming up a bit more each day. 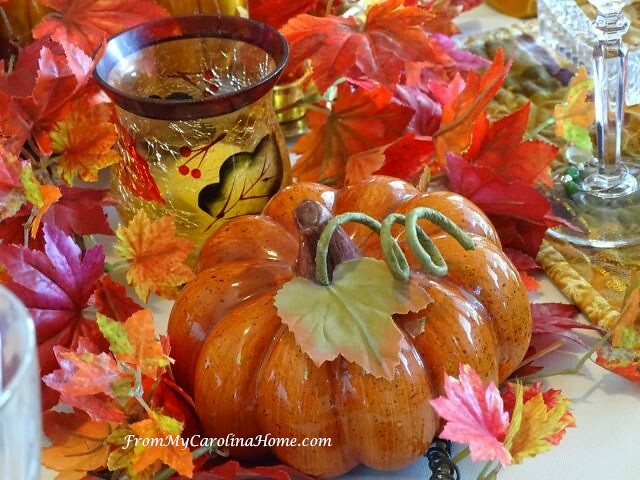 Love your Autumn table scape the pumpkins your plates are just gorgeous. So many are turning thoughts to fall and with the seasons warm colors it’s easy to see why. Your table captures them well. 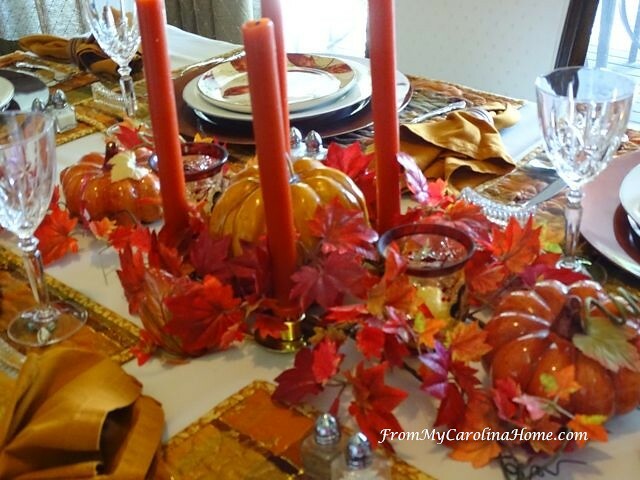 I love your autumn table, Carole! I think you should buy the dinner plates! Pier 1 always has something I want! HA….I was running so fast commenting this morning from the party that I didn’t make the connection until now. You are the one who commented on my blog this morning:) Next time I won’t get confused, I will follow and definitely will come back! Thanks so much! 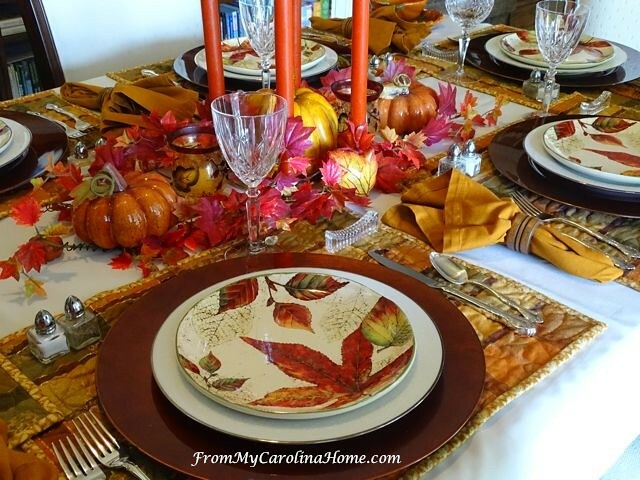 Carole, your autumn table is just gorgeous! Love the leaf plates! 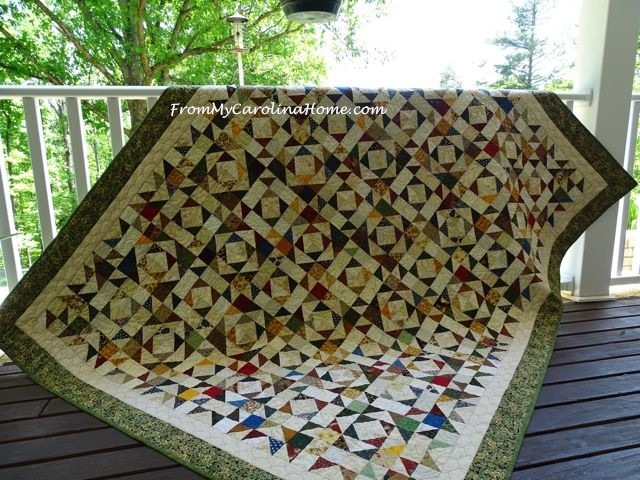 Thank you sharing at Vintage Charm–pinning! Oooh. I love all of the fall leaves here. Your table would go well with my glass leaf plates. 🙂 Is it just me, or are there more dishes for fall than any other holiday? I just keep seeing more and more this season, all very difficult to resist. Lovely table here. That’s just beautiful! I love those plates too! 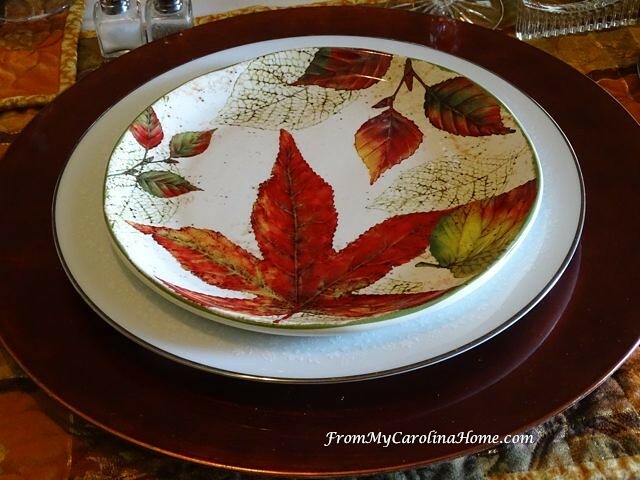 I get a lot of my salad plates from Pier 1 – they are hard to resist and add that nice seasonal touch. You’ve reminded me I need to get my Fall plates out. 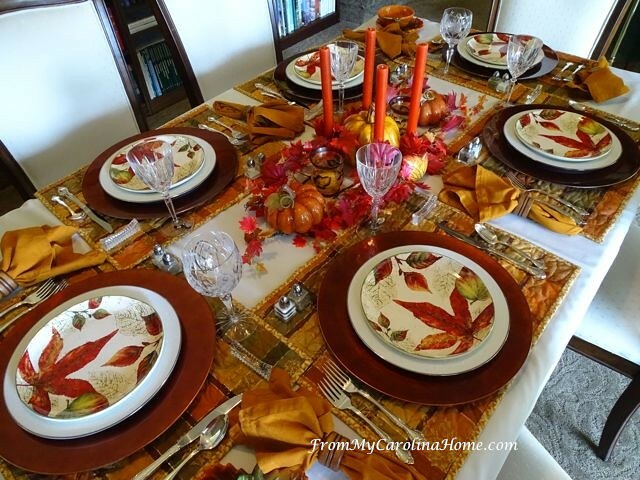 I just adore the colors of your table setting! Beautiful!